When Joe Gerber immigrated to America in 1940, he was certainly in a hurry. Escaping Nazi Austria, he rushed out of the country with his mother and wasted no time getting to work. He flew through high school in just two years, despite starting with little knowledge of English. Gerber’s fast-paced life continued when he started college at Rensselaer Polytechnic Institute the next year. In an attempt to finish his engineering homework faster, he invented the variable scale, a device that saved hours of time calculating points and curves on graphs. And he wasn’t finished yet! By 1950 Gerber was a successful entrepreneur and president of the Gerber Scientific Instrument Company, where he saved the time and resources of many customers. 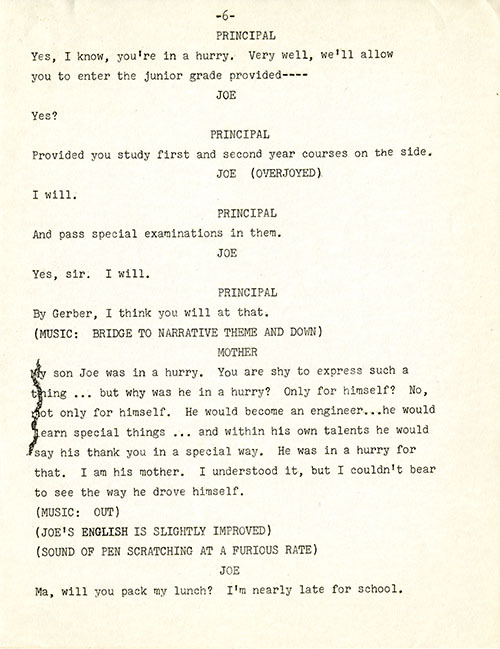 The National Museum of American History Archives Center recently acquired Heinz Joseph Gerber’s personal papers, including scripts, letters, and photographs from the 1950 broadcast of Young Man in a Hurry. Photo of the Young Man in a Hurry script. NMAH Archives Image AC1336-0000003. In an attempt to improve their public image and sales, the DuPont Company hired BBD&O in 1935. After World War I, the company was viewed by many as a war-profiteer and manufacturer of weapons and death. 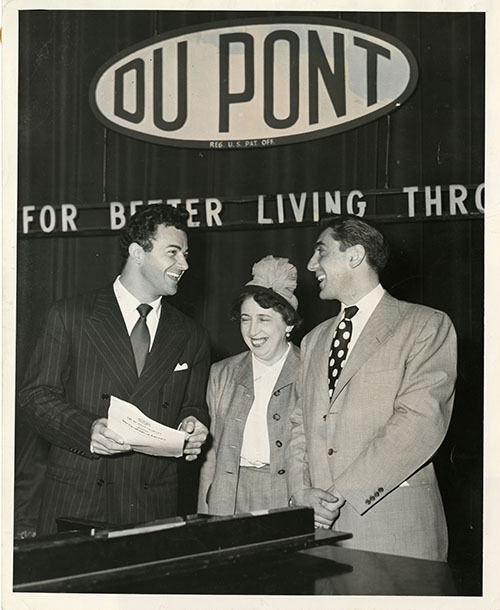 BBD&O began their public relations campaign by creating the slogan “Better things for better living…through chemistry.” The new slogan suggested that DuPont’s products were an important part of American life in peacetime, that they made ordinary life better. That same year, BBD&O persuaded DuPont to sponsor a radio program, the Cavalcade of America. Each episode honored a different individual from American history. Voice actors played famous individuals like George Washington and Buffalo Bill Cody, telling their life stories and accomplishments in dramatic fashion. Other important Americans such as Clifford Holland, the creator of the Holland Tunnel, and the developer of vulcanized rubber, Charles Goodyear. The hero of each episode displayed the same qualities that DuPont claimed for itself: inventive, hard-working, and a champion of American life. Gerber’s impressive life story, an embodiment of the “rags to riches” American dream, easily qualified him for a spot on the Cavalcade of America. The inventor was approached by BBD&O and asked if he would appear on the program. Gerber agreed, and radio writer Morton Wishengard wrote the script of Young Man in a Hurry in 1950. The Cavalcade of America often featured top voice talents like Orson Welles and Errol Flynn, and Gerber’s episode was no exception. Cornell Wilde, a popular film and radio actor, was selected to play Joe Gerber, while actress Virginia Payne (famous for her role on the Ma Perkins radio show) performed the roles of narrator and Bertha Gerber, Joe’s mother. Photo of Joe Gerber, Bertha Gerber, and Cornell Wilde. NMAH Archives Image AC1336-0000002. Young Man in a Hurry began Gerber’s life story on the eve of World War II. As a teenager living in Vienna, Gerber and his family found themselves the victims of Nazi oppression and violence. After being forced into a forced labor camp, Gerber and his father tried multiple times to escape but failed each time. Gerber’s father was soon deported to Poland and never heard from again. Eventually, Gerber and his mother were able to successfully travel to America and they settled in Hartford, Connecticut. Only able to speak German, Gerber learned English working on a tobacco farm and from the radio. The next year, he enrolled in high school and convinced the faculty to let him take all the required courses for his freshman, sophomore, and junior years all at once, taking examinations in the classes he couldn’t fit into his busy schedule. At the same time, he managed to hold multiple jobs and practice his English enough that he was soon practically fluent. In the broadcast, Joe Gerber exclaimed “In my heart, in my mind, in my soul I am for engineer [sic]. American engineer.” He was in a hurry—to begin a career in engineering. When Gerber graduated in 1943, he impressed his teachers enough that they awarded him a scholarship to attend Rensselaer Polytechnic Institute. In a background interview with Cavalcade of America writers, Gerber said that by receiving the scholarship, he learned “that in USA it was true you could accomplish things if you were willing to work because then people, recognizing not only your abilities but your earnestness, will give you of themselves beyond belief to help you.” As a junior at RPI., Gerber capitalized on the help he received from others and his own desire to become a great engineer in a hurry when he created his first invention, the variable scale. The Cavalcade of America could hardly have made the story of the variable scale more fantastic than it really was. One night in 1946, Gerber was sitting in his room working on his engineering homework. Frustrated by the time it took to measure the length of curved lines, he ripped the elastic band out of his pajamas and fashioned a rubber ruler out of it that could bend and flex. And it worked! “I’ll be a cockeyed monkey,” Gerber’s roommate exclaimed when he realized how quickly engineering homework could now be done—calculations that used to take hours to finish could now be done in a matter of minutes. In Gerber’s haste to finish his engineering homework, he had invented a revolutionary new tool. 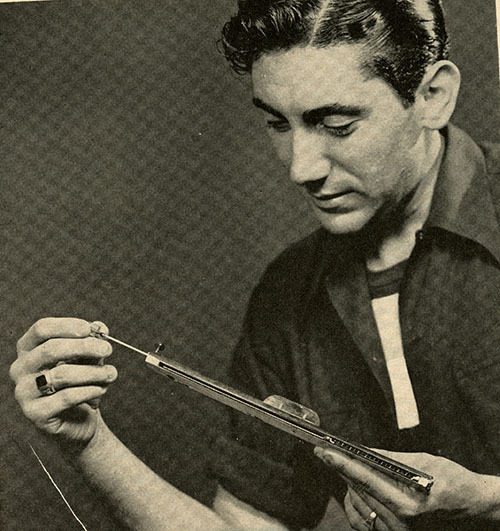 Photo of Gerber with the variable scale from Nation’s Business (1949). NMAH Archives Image AC1336-0000004. The Young Man in a Hurry broadcast ended with Gerber founding the Gerber Scientific Instrument Company to market and sell his extraordinary invention. Confident that engineering firms, scientists, and even the military would be interested in the variable scale, he borrowed $3,000 from Hartford businessman and friend Abraham Koppelman and started what would become a thriving corporation with millions of dollars in sales. “We came to America in a time of our need,” Gerber said at the finale of the program, “we sought the American Dream. And like so many others…we found it.” The variable scale was made possible by Gerber’s inventive mind and will to succeed, and also with the help of many teachers, family members, and friends along the way. 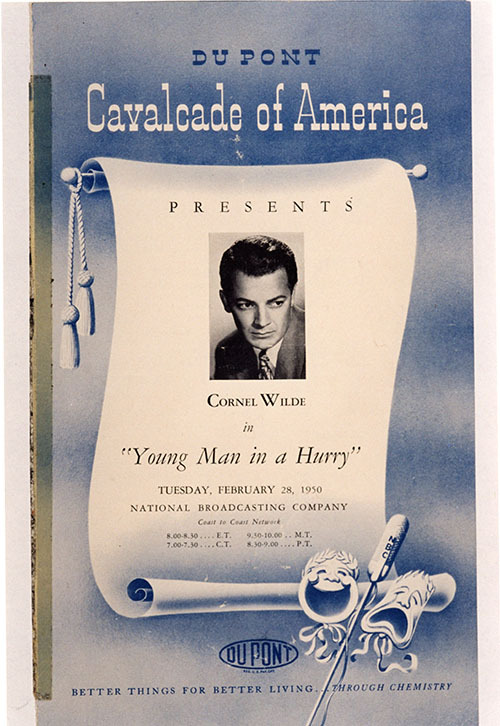 To listen to the entire broadcast of Young Man in a Hurry (episode #613) and other episodes of the Cavalcade of America, click here. Joe Gerber’s story was heard by an estimated seven to ten million Americans when it was first broadcast on February 28, 1950. After the episode’s initial success, it was re-broadcast on N.B.C.’s Eternal Light radio program and received positive reviews from critics. Before long, Gerber’s mailbox was full of letters from friends and well-wishers raving about the broadcast. “I am writing to congratulate you upon having been given the rather high honor of having been the subject of an important nation wide broadcast,” one Hartford lawyer wrote. Gerber’s former classmates and teachers from RPI were equally excited about the broadcast: “we are very proud of you…because you have accomplished something big enough to make you eligible for a place on that program,” exclaimed another letter. Joe Gerber’s success story as an immigrant, inventor, and entrepreneur was only just beginning when it was broadcast in 1950, and it was amazing how much he accomplished in such a short amount of time. His desire to learn, invent, and make a difference in other people’s lives was every bit as sensational as it appeared in the Young Man in a Hurry broadcast. The Archives Center has many records documenting Gerber’s inventions and his inventive life, including the Gerber Scientific Inc. Collection and the Gerber Fabric Cutter Video Documentation Collection. Come check us out to learn more!